122+[1 ad] pages with diagrams, appendix and index. 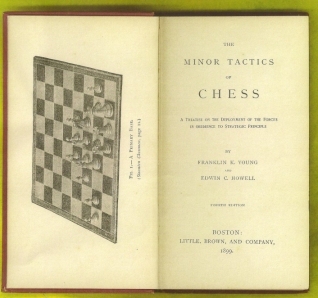 Duodecimo (6 3/4" x 4") bound in red cloth with gilt lettering to spine and front cover with pictorial chess boards. (Betts: 11-2) Fourth edition. Originally published in 1894. Prefaced by a brief, but complex, introduction to the elements, this is chiefly an exposition, in mathematico/military language, of "ideal" pawn and piece configurations and the type of plan which should develop from each. With seventeen illustrative games. Spine ends and corners rubbed, corners gently bumped, previous owner's name on front end paper else a very good copy issued without jacket.